It has been over 500 years since the last “Moor king” was expelled from the Alhambra in Granada by the Catholic Monarchs. The red castle, Al-Hamra, was for over 200 years the last bastion of the Nazari Kingdom in Al-Andalus, on a hill, with the snowy mountains of the Sierra Nevada as a backdrop. Who strolls today through its beautiful walled enclosures can still feel the magic of past days This monument was a royal palace and military castle during the Nasrid dynasty. The Alhambra is a reflection of this Nasrid culture; he last Arab kingdom in the peninsula where artists and intellectuals sought refuge as the reconquest progressed in Al-Andalus. Built in the mid-thirteenth century by Mohamed I, his descendants later expanded the medina (city) and strengthened its defences. The interiors of the palaces dazzle with exquisite beauty, showing the great Arabic artistic skill at that time. The Nasrids were also true architects in designing irrigation systems and running water, whose gentle murmur is present throughout the site as fountains, ponds and streams. In 1492 the Alhambra fell into the hands of the Catholic Monarchs. The legend says that Boabdil, the last king of Granada, on his way to exile stopped on a mountain on the way to the coast, looked back at the Alhambra and started crying. In fact, the name of this place is “The sigh of the Moor” (El Suspiro del Moro). Visiting the Alhambra is undoubtedly one of the recommended activities you can’t miss when visiting southern Spain. But why is the Alhambra in Granada so popular? Let’s look at some of the reasons. It is a group of palaces and gardens in the heart of Granada;built for the monarch and the Nasrid court of Granada. Its interior has one of the best representations of Andalusian art. I’m not going to make a complete and detailed guide of the Alhambra, I already did one here; in Wikipedia they provide details about each of the rooms and their history. What I am going to do is tell you some of the particularities of this great monument and why it is one of the most visited every year in Spain. In this area you will find some representations of Andalusian art; a sample of the mastery achieved by the ancient artisans who worked in the enclosure. The muqarnas and the exquisite decoration of the columns suggest to us the great care and attention to detail that the craftsmen paid in the past. The muqarnas are prisms that hang from a surface and resemble stalactites. 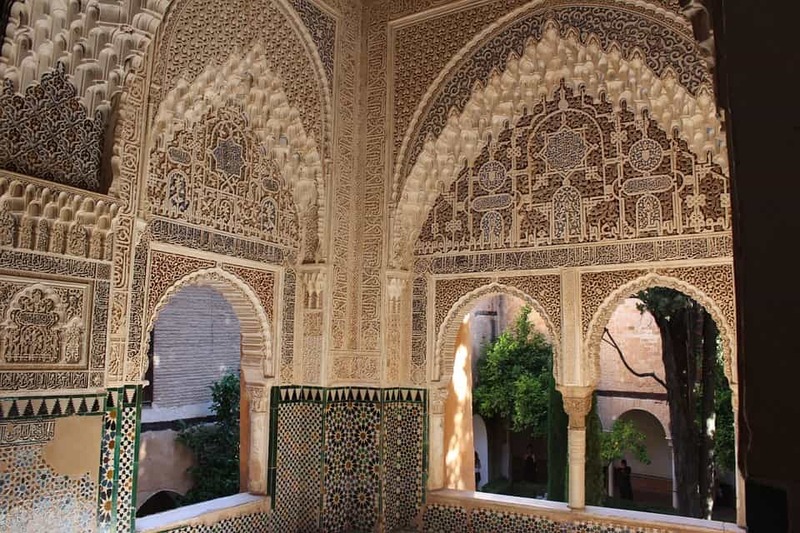 The decoration of the Alhambra is carefully designed down to the smallest detail. The Courtyard of the Lions represents the paradise dreamed of by the Muslims. It is one of the highlights of Nasrid art. It has a rectangular floor plan surrounded by a colonnade that supports a detailed archway with geometric and calligraphic decoration. 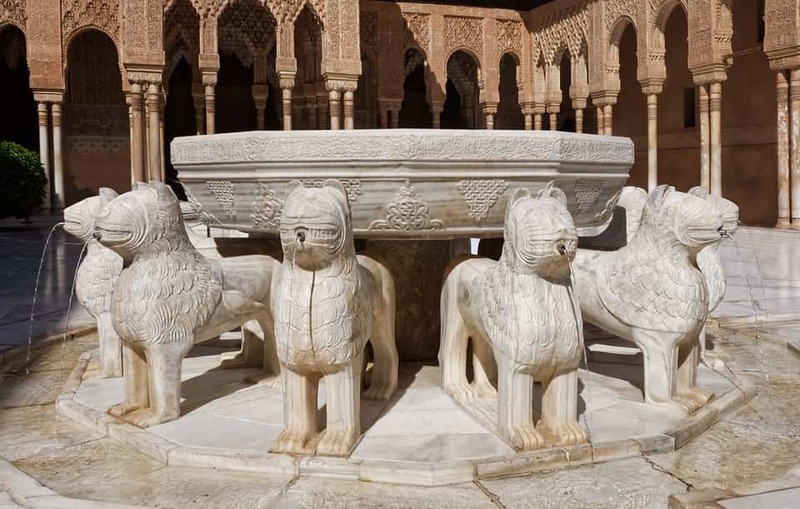 The fountain in the Courtyard of the Lions is held by 12 lions ready to defend the sultan. We can find decorative and architectural elements of great beauty waiting for us everywhere in this monument. Villa surrounded by gardens and originally used by the Andalusian kings as a place of retreat and rest. Built during the 12th and 14th centuries, they are a place to stroll through; this area is separated from the Alhambra. 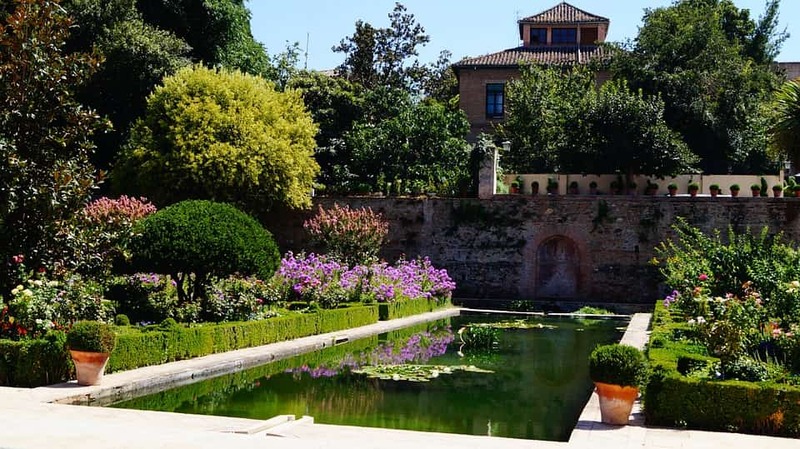 Walking through the gardens you will find two different courtyards, one called Patio de la Acequia and the other known as Patio del Ciprés de la Sultana. Amazed by the beauty of the Alhambra the monarch Carlos I order to built a palace within its walls in 1527.The intention of the palace is to establish his permanent residence in this place. With a circular floor plan and two floors, this palace is an attempt to create a more modern and comfortable residence with respect to that time. There are many sights on the surrounding area you may not want to miss. For those who likes the stories and legends of this kingdom extinct long ago, can read the Tales of the Alhambra by Washington Irving, who travelled to Granada in 1829 and lived for four months at the Alhambra and wrote the stories of his collection. This book was partly responsible for the re-discovery of a deteriorated Alhambra after the Napoleonic War. Actually, the Alhambra in Granada is a World Heritage Site and one of the most visited monuments in Spain. Who wants to immerse in medieval Arabic narrative, can check the following link “Tales of the Alhambra” for a free online reading. I highly recommend it! There are many more stories and facts to read about this amazing monument and Granada. Don’t forget to check back often or subscribe our blog! Previous Previous post: Blood Moon from Malaga and total eclipse – When and from where to see it?